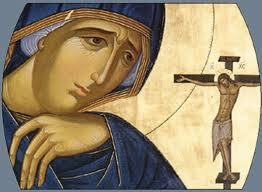 St. Mary is respected as the patron saint of penitents. Ran away at the age of 12 to Alexandria. Spent her life there as a harlot for 17 years. She refused the money of her male suitors and lived mainly from begging and spinning flax. 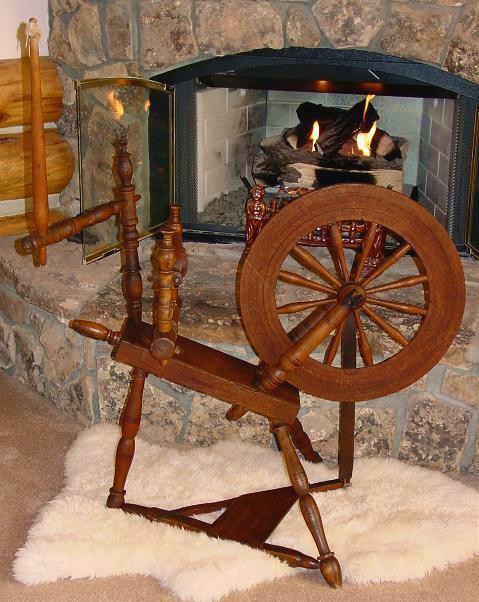 Here is a flax spinning wheel. She went on an anti-pilgrimage to Jerusalem, paid for her voyage by offering sexual favors. Denied into the Church of the Holy Sepulchre, because of this she prayed to the icon of Theotokos for forgiveness and stated that she will become abstinent. Escaped to desert and lived her life of abstinence, surviving on 3 loaves of bread. She was tempted by wild-beast and passions but Theotokos guided her. Near death she met. St. Zosimas of Palestine. She narrated her story to him. Asked him of holy communion, and he did. She told Zosimas to meet her the following lent in the same spot and he did, but when he got there she was lying there dead, but written in the sand was that she had died the night he gave her communion and her body was transported there. Her story has been down orally to most orthodox and was first recorded in written word in a vita by St. Sophronius. Their website has many neat components. 2 audio files: “Life of Holy mother Mary of Egypt” and “St. Mary of Egypt and the Grace of the Holy Mysteries by Fr. Dn. 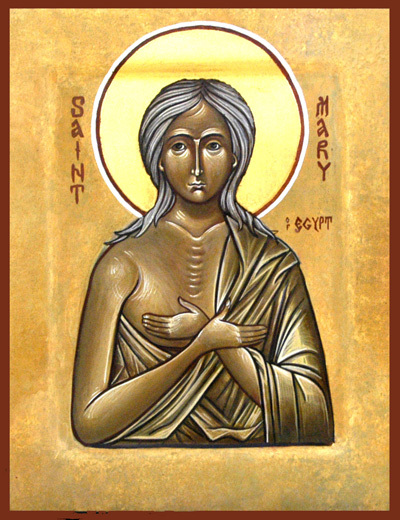 Matthew Steenberg” An orthodox point of views/summaries about St. Mary of Egypt’s life. “St. Mary of Egypt was a young woman who followed the passions of the body, running away from her parents at age twelve for Alexandria. There she lived as a harlot for seventeen years, refusing money from the men that she copulated with, instead living by begging and spinning flax” (St. Mary of Egypt Orthodox church). 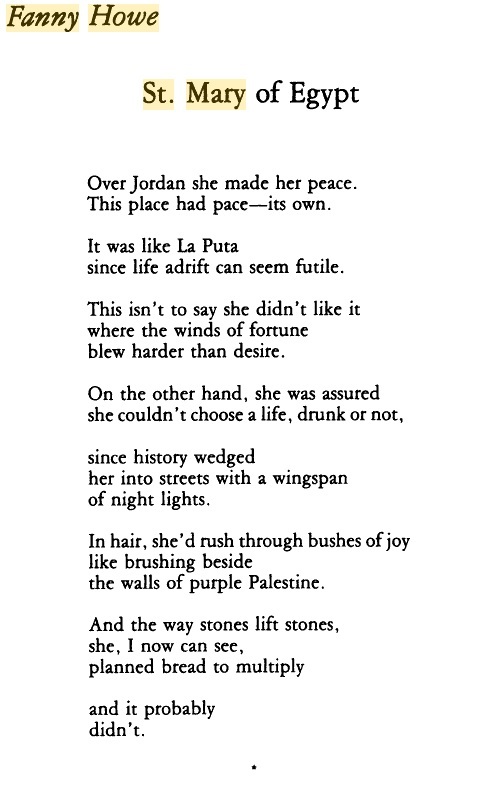 The poem is a summary about St. Mary’s journey as a prostitute. The fact that Fanny chose to write about Mary’s life in a poetic form is ironic because poetry is typically seen as higher class and prostitution is low. However, the fact that Mary becomes a saint could be the reason why Fanny chose poetry instead of another form of literature. 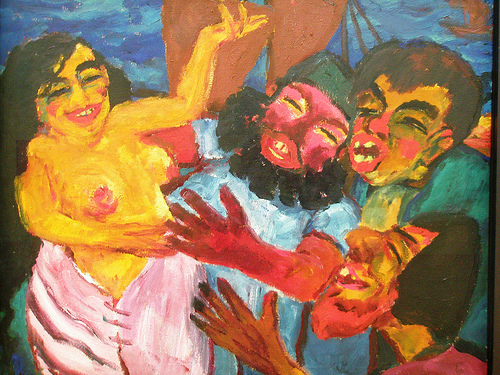 This painting is Nolde’s depiction of how it was like for Mary on her anti-pilgrimage to Jerusalem. Notice how the men flock towards her in urge for sexual favors. She seems very passionate to do favors for them. This 3 minute clip/ movie that reenacts St. Mary’s journey as a prostitute. Here is a long movie with English subtitles about her life. Many orthodox churches celebrate her story during lent. Howe, Fanny. “St. Mary of Egypt.” Ploughshares Vol. 5. No. 3. (1979): 72 – 78. Web. Thompson, Anne. 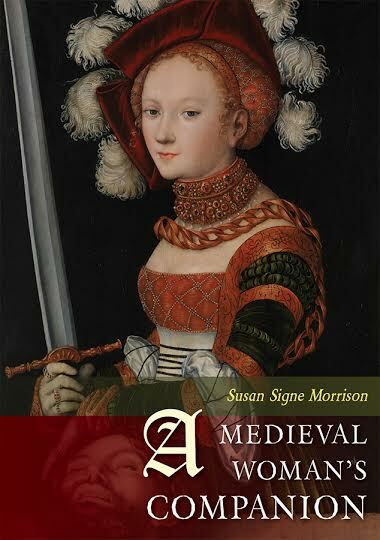 “Review of The Old English Life of St. Mary of Egypt by Hugh Magennis.” Speculum Vol. 80. No. 1 (2005): 269-270. Web. Sieger, William. “Emil Nolde’s ‘Legend: St. Mary of Egypt’: ‘ Vita Activa’/ ‘Vita Contemplativa’.” The Burlington Magazine Vol. 147. No. 1223 (2005): 100-107. Web.